Definition at line 53 of file llviewerjointmesh.h. Definition at line 86 of file llviewerjointmesh.cpp. Definition at line 94 of file llviewerjointmesh.cpp. Definition at line 103 of file llviewerjointmesh.cpp. 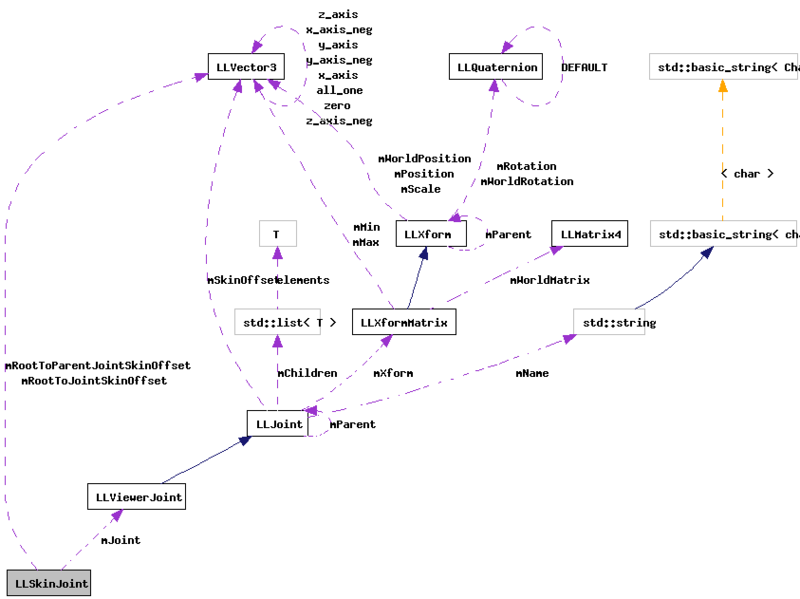 References LLVector3::clearVec(), LLJoint::getParent(), LLJoint::getSkinOffset(), llendl, llinfos, mJoint, mRootToJointSkinOffset, mRootToParentJointSkinOffset, and TRUE. Definition at line 60 of file llviewerjointmesh.h. Referenced by LLSkinJoint(), LLViewerJointMesh::setupJoint(), setupSkinJoint(), and ~LLSkinJoint(). Definition at line 61 of file llviewerjointmesh.h. Definition at line 62 of file llviewerjointmesh.h.